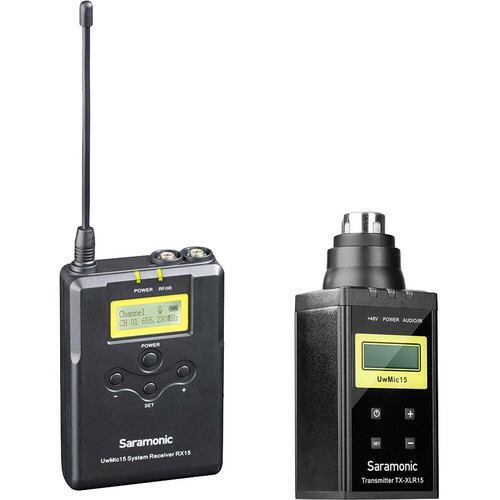 Step your next video project up to broadcast-quality audio with the Saramonic UwMic15B Camera-Mount Wireless System with Plug-On Transmitter, a portable UHF wireless system for capturing audio from a single subject. It includes one portable receiver, an XLR plug-on transmitter with selectable 48 VDC phantom power, and a bundle of cables and accessories. With a maximum operating range of 330 feet, it can be effectively used in an array of environments for video, interview, broadcast TV, and ENG applications. The system's RX15 receiver features an easy-to-read LCD screen, support for camera- or belt-mounting configurations, and 16 selectable channels. It boasts infrared synchronization with the transmitter and two locking audio outputs—a 3.5mm line out, and a 3.5mm headphone jack for real-time monitoring. Use the supplied 3.5mm and XLR output cables to connect the RX15 directly to the input of your camera, mobile device, or mixer.The plug-on transmitter employs a crystal-controlled PLL synthesizer and a power button that also provides quick access to mute and channel selection. It sports a locking 3-pin XLR input jack for compatibility with your favorite XLR-equipped dynamic or condenser microphone. The transmitter and receiver are each powered by two AA batteries (available separately).